EDIT: The YouTube app now has native “go live” functionality. I would recommend YouTube Live over Ustream due to its familiar interface and being part of the Google ecosystem which I already use often. 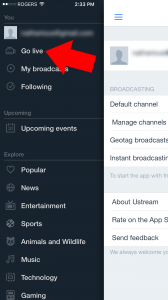 If you have a YouTube account, you can activate YouTube Live and stream right to your YouTube channel. This sounds cool (and free… well, ad-supported) but the broadcast feature appears to be missing from the iOS YouTube app and in order to do this on a computer you need to download encoding software and have a camera and microphone… not impossible but the ease of mobile broadcasting is attracive. 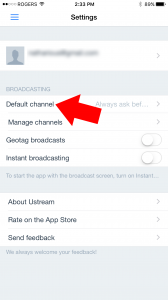 I believe this is an upcoming feature in the iOS YouTube app and this would definitely be my go-to broadcasting app. I will be keeping an eye out for this! 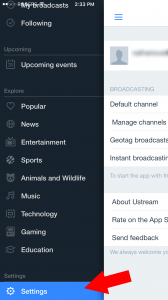 Ustream is a popular streaming app and is owned by IBM. They have a basic version that allows you to have 50 viewers per country. There is a 30-day trial for unlimited viewers so this might be great for a one-time event. The cheapest premium option is around $100/month which seems expensive, especially if its not something you will use regularly. 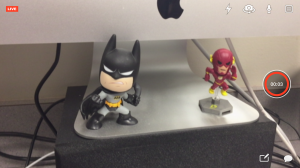 I downloaded Ustream onto my iPhone and was pretty impressed with how quickly I was up and running. I’ve blurred my channel out for privacy but this will be how you will find your Ustream channel. 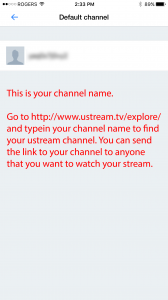 Go to http://www.ustream.tv/explore/ and type in your channel name into the search bar. You will find your channel. You can send this URL to anyone who wants to watch your live stream. Unfortunately you can’t rename your channel with the basic version. Tap the red circle and a LIVE icon will appear in the top left hand corner. 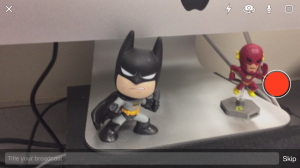 Now, anyone watching your channel on the ustream website will see what you see, live! I did notice a 15-20 second delay on the stream from when its recorded to when it appears on the website. Things like presentations or special events are often limited by space and not every student can be a part of it. With live streaming, teachers could share the live streaming link with their colleagues who would then have the option of showing it to their classes through the live stream. Kind of a neat idea!